Many Iranian filmmakers, reflecting the general inclinations of their Persian culture, make movies with distinctly philosophical themes and undertones. Their films oft en explicitly confront issues of life, death, and the meaning of existence. Abbas Kiarostami belongs to this grouping, but his films have attracted an additional interest among the more cerebral film-goers and critics, thanks to his distinctive, reflexive style of filmmaking. The fascination lies in the way his films explicitly call attention to the manner in which the world is depicted on film and, by extension, to the way reality is understood by all of us. This adds a further dimension to the philosophical inquiry: under examination is not only the meaning of life but also the phenomenological nature of experienced reality. But this kind of intellectualizing about cinematic reality has the danger of being overly schematic – which is precisely the mode of engagement that Kiarostami would seem to be wanting to overcome. The problem is that the narrative possibilities of film are examined explicitly in these exercises, but they are not exploited in the cinema-viewing experience. 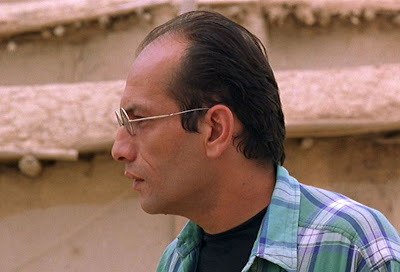 Another cinematic exploration precisely along these lines, but one of Kiarostami’s most successful efforts to establish a narrative context and still engage in his thematic inquiries, was The Wind Will Carry Us (Bād Mā-rā Khāhad Bord, 1999). 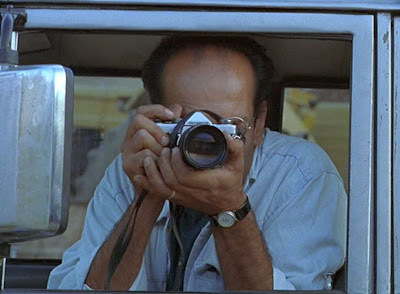 The film, written and directed by Kiarostami and shot with nonprofessional actors, features evocative cinematography of the Iranian countryside by Mahmoud Kalari, who has also worked on Leila (1996), The Pear Tree (Derakhte Golabi, 1998), The Willow Tree (Beed-e Majnoon, 2005), and Offside (2006),. The assistant director was Bahman Ghobadi, who would soon emerge as a first-rate director in his own right and would further propel images of Kurdistan to worldwide audiences. The story of The Wind Will Carry Us begins with long shots of a car passing along winding roads through the Iranian countryside, while the passengers engage in idle conversation about their itinerary. 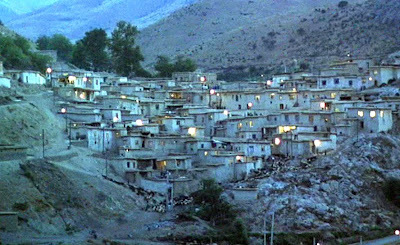 The film narrative technique of slow disclosure, wherein a setting is established and the viewer is forced to piece together a narrative backstory on the basis of slowly revealed contextual clues, is used here, but Kiarostami pushes this to an extreme. It takes a considerable amount of time before the viewer can piece together what the point of this journey is all about. Eventually, it is revealed (but only obscurely) that the travellers are headed for a remote village some 700 kilometres from Tehran, carved into the side of a mountain in Kurdistan. Their task is to record a traditional funeral ceremony that is anticipated will take place following the death of a very old village woman who is expected to die very soon. Since there are three men in the team driving to the village, the assumption is that this is to be a documentary film about the event, although no cinematic equipment is ever seen in the film, only the still camera of the principal character, Behzad. Funerals are held quickly after death in Iran, so the camera crew has to be on the spot and ready at the time of death. When the men reach the village, they are greeted by a young schoolboy, Farzad, who has been assigned by the local contact to be their guide. Behzad immediately asks Farzad about the condition of the old woman, Mrs. Malek. It becomes apparent that the sooner this woman dies and the ceremony is held, the sooner the men can complete their mission and return to Tehran. But the woman isn’t quite ready to die, and the men have to cool their heels in the village until she does. As the film proceeds, it gradually becomes clear that Kiarostami’s story is not really going to be about the pageantry of a death ceremony or the filming of it, but about what Behzad sees and what is on his mind. So Behzad has to wait, and time passes. While idling around, Behzad pokes about the village, talking to Farzad, drinking tea at a local tea house, and looking for some milk to add to his tea. Periodically he is interrupted by cell-phone calls from his impatient producer, Mrs. Godzari, back in Tehran. 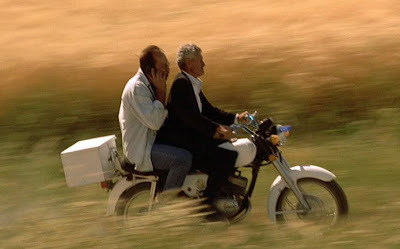 In order to get adequate reception for the call, Behzad has to jump into his truck and drive up to the top of a local hill where the cemetery is located. On these phone-call occasions at the hilltop, Behzad befriends a ditch digger, Yossef, and has some conversations with him. Yossef, imbued with the characteristic Iranian traditions of courtesy and hospitality, invites Behzad to get some milk from his “woman”, Zeynab (perhaps his betrothed), in the village. So Behzad seeks her out, and he converses with the young lady as she milks a cow in a darkened stall in order to provide him with some milk. Little by little, Behzad is getting involved with the village and its life. Eventually, a cataclysmic event occurs – Yossef is trapped when the tunnel that he has been digging caves in. Behzad rushes to the village and recruits rescuers and summons a doctor to save the ditch digger. They tell me the other world is as beautiful as a houri from heaven! Yet I say that the juice of the vine is better. Prefer the present to those fine promises. Even a drum sounds melodious from afar. 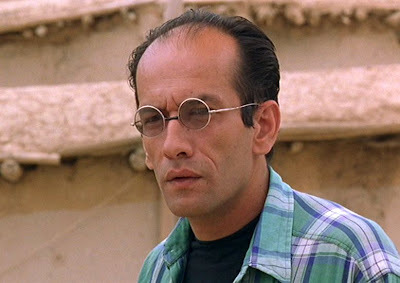 When old Mrs. Malek finally does die at the end of the film, Behzad has lost interest in the funeral ceremony. He is more interested in photographing all the women of the village marching towards the ceremony. 1. Slow disclosure. As already mentioned, slow-disclosure is extended throughout the film. The viewer only gets little scraps of information from time to time that reveal some of the goings-on in the village. This works, because Kiarostami has given us one key narrative target for Behzad: the impending death of old Mrs. Malek. 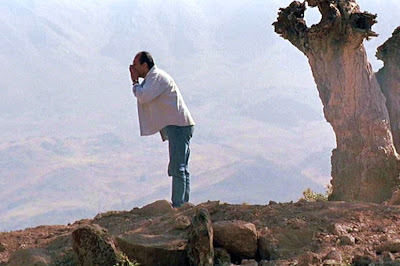 This narrative element is what makes The Wind Will Carry Us one of Kiarostami’s most effective film experiences. As we scrutinize all the details for more information about her, we pick up other nuances along the way. When Behzad converses with some of the these people, the camera focusses on Behzad’s reactions to what they say. Behzad is different from everyone around him – not only is he the only clean-shaven one, he is the inquisitive one, the seeker. 3. The Watchers Watched. Behzad is an observer, a watcher, and we, the viewers, are observing him as he watches others. In addition, three village people who are shown in full face are, in one way or another, observers, themselves. These are the only people in the film that we really get to see, besides Behzad. The elderly lady who operates the tea house is an outspoken critic on all that goes around her. She admonishes Behzad for expressing surprise at seeing a woman serve him in a commerciall setting, criticises her husband, and rebukes drivers who par k their noisy and air-polluting cars near her shop. Farzad’s schoolteacher, who has a conversation with Behzad about the local funeral ceremony, sees things critically. For him the funeral ceremony is not a colorful pageant but a dysfunctional mechanism of the local economy. People use it merely to demonstrate their loyalty to the local landlords and bosses. The ceremony from his perspective is not an expression of spirituality, but simply an opportunity for expressions of fealty to the local “warlords”. Farzad is an observer, too. He’s studying hard at school (and so far, according to his marks, not doing very well) in his efforts to learn more about the world. He innocently reports what he sees and what he hears. Clean-shaven. Behzad’s bespectacled and clean-shaven face clearly differentiates him from the other adult males of the area – he is from the more educated, elite portion of society. 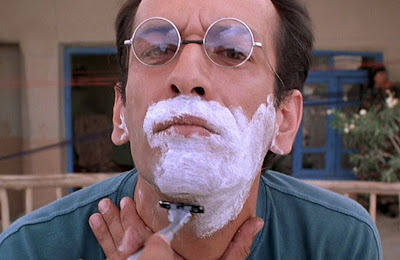 And this is accentuated by the several scenes showing him in the act of shaving. The villagers respectfully address him as “Engineer”, thereby giving him the appellation of someone presumably technically trained and capable. But the village doctor reminds him not to exaggerate these differences, but to plunge into the whirlpool of life. Elevation. Behzad is constantly going up to the hilltop, where there is a cemetery, to communicate with the outside. This might suggest our rituals to find heavenly messages. But this communication turns out to be fruitless. His most effective observations and interactions are in the downward (and down-to-earth) direction, particularly when he communicates downward with Yossef in the ditch and when he converses with Zeynab in the stall. Light and Dark. The people with whom Behazd interacts best, Yossef and Zeynab, are surrounded by darkness, but he is nevertheless reaching out to them and having sincere and meaningful interactions. This idea is highlighted in the title-evoking poem by Forough Farrokhzād listed below. On the whole, The Wind Will Carry Us is a mission of discovery for Behzad. Little by little, Behzad, the observer and watcher, gradually becomes more enmeshed in the life of the village and feels the need to take action in order to save Yossef. He comes to realize the truth in the doctor’s recommendation that the vital present, not in the ceremonies and treatises on death and the afterlife, is where to find God. And it is with Zeynab that he makes an uncertain contact when he recites to her a poem by the famous 20th century woman poet, Forough Farrokhzād. The wind is about to meet the leaves. Hark! Do you hear the whisper of the shadows? This happiness feels foreign to me. I am accustomed to despair. The moon is red and anxious. Await the birth of the rain. One second, and then nothing. And the earth stops spinning. Worries about me and you. It is true those are only words, but they point in the right direction: towards lif e, love, and the present wonder of existence. And as Behzad points out to the 16-year-old Zeynab, it is not necessary to be a scholar in order to write and appreciate words like those in that poem. Forough had only a 9th-grade education, but she published her first volume of poetry at the age of twenty and went on to become one of Iran’s great modern poets before her tragic early death. The analysis is amazing. One of the best written film criticisms ever. But have you noticed Behzad's take on death? He's waiting for the invalid to die in all earnesty, while he puts in all his efforts to save Yossef. Also, rising up the hill might also serve to indicate that the village is coocooned from the outside world; it is a world in itself with it's own traditions and customs that the filmaker has come to document.